I had business in Milwaukee last week, north of the city. On the way back to the airport I pulled off downtown to have a look around. I used to drive through MKE quite a bit when I worked for Kohler, although I never explored it much since we would usually fly in and drive straight to HQ in Sheboygan. A few times we did go downtown, usually at night, and I remember the streets having a great vibe. So on this early, cloudy April day I parked the car and walked a few blocks. 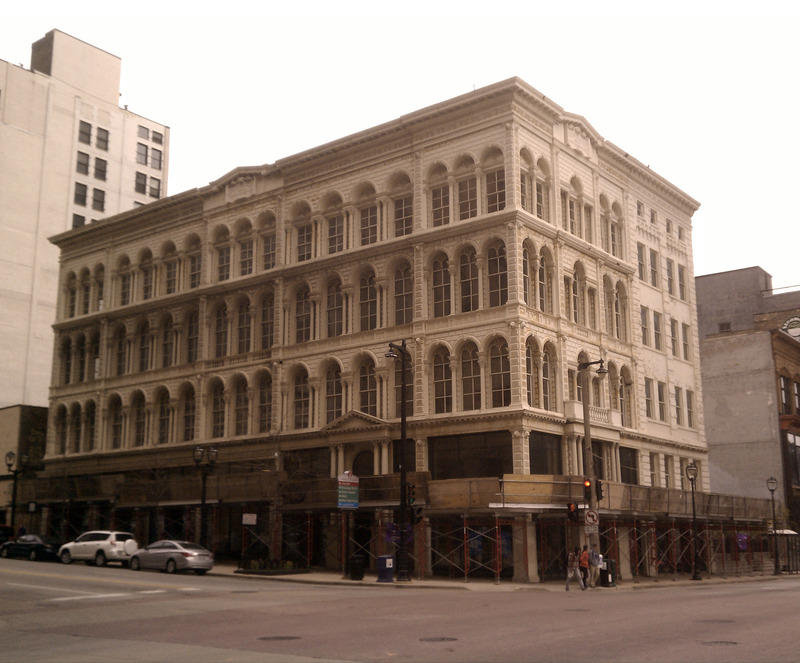 The building above seemed to be a cast iron facade, which could place it as old as say 1860. I plan on returning soon and hopefully the scaffolding will be down so I can look for a plaque. The building below, and it’s next door cousin to the right, seemed to be late 1800’s with a Second Empire Revival feel – almost a Frank Furness influence on the tower. 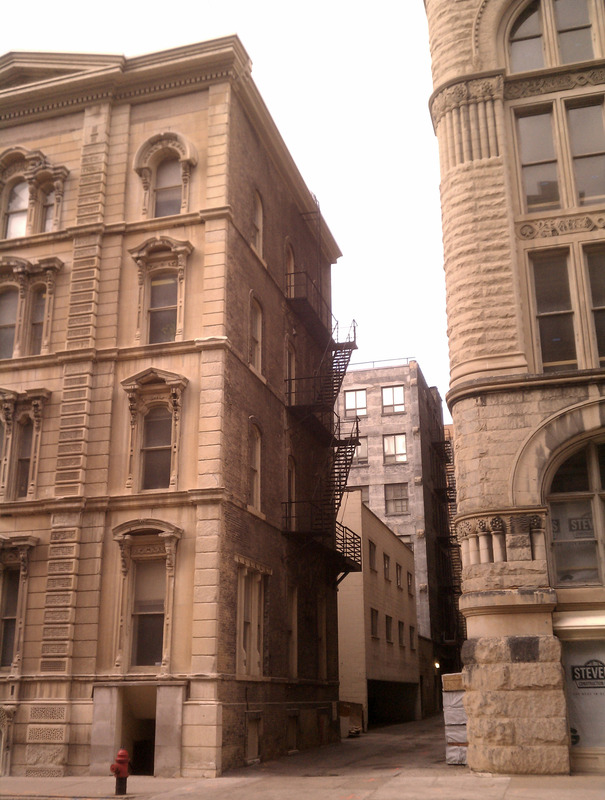 These two buildings are joined by several floors of improvised covered hallways over the conjoined alley. I really wanted more time to look over these buildings with more detail. 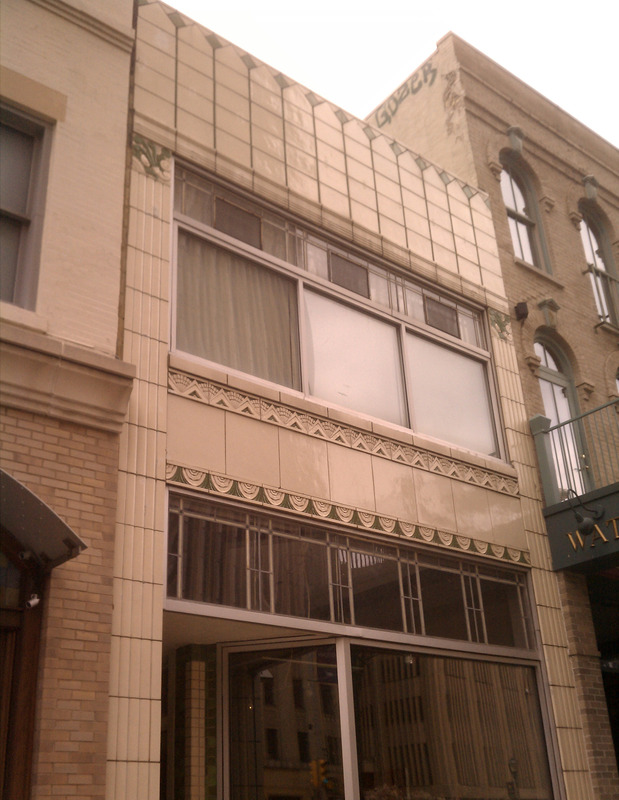 The building below was prominently located in the center of downtown. Seeing the flag at the top of the bell tower, I guessed (correctly) that this was City Hall. When back at the airport I looked the building up on Wiki; this was the tallest building in the world from its completion 1895 to 1899. 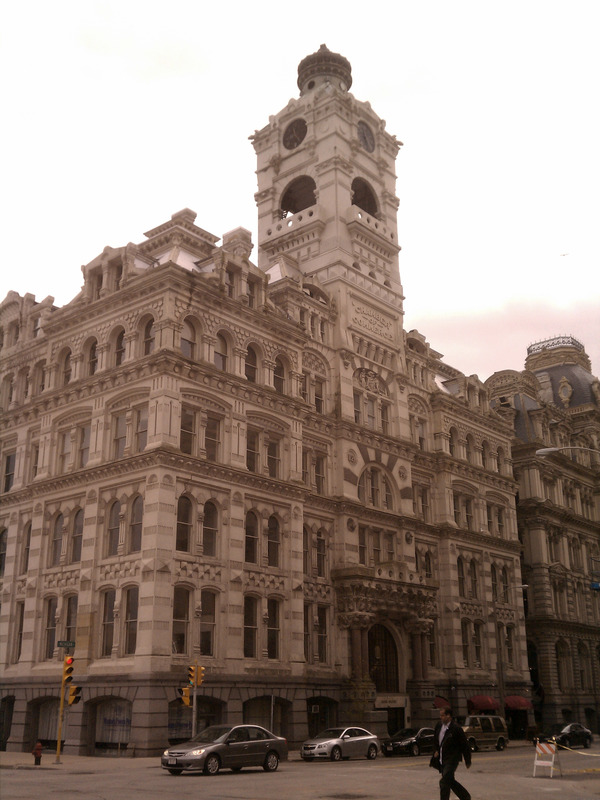 Designed by Henry C. Koch in a German Renaissance revival-style, this remained the tallest building in MKE until an office tower surpassed it in 1973. I have to admit singing the tune to Laverne and Shirley in my head while walking around. 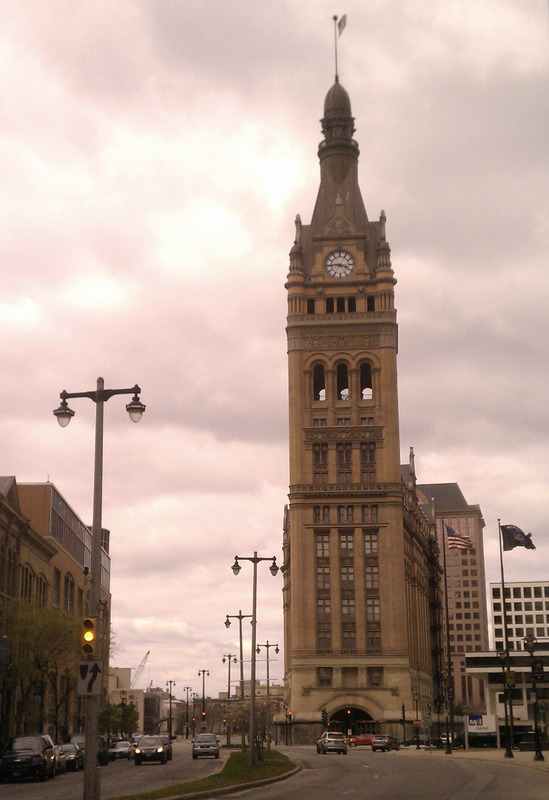 If I had remembered the opening sequence, this tower is briefly shown with the sign “Welcome to Milwaukee”, however since-removed. 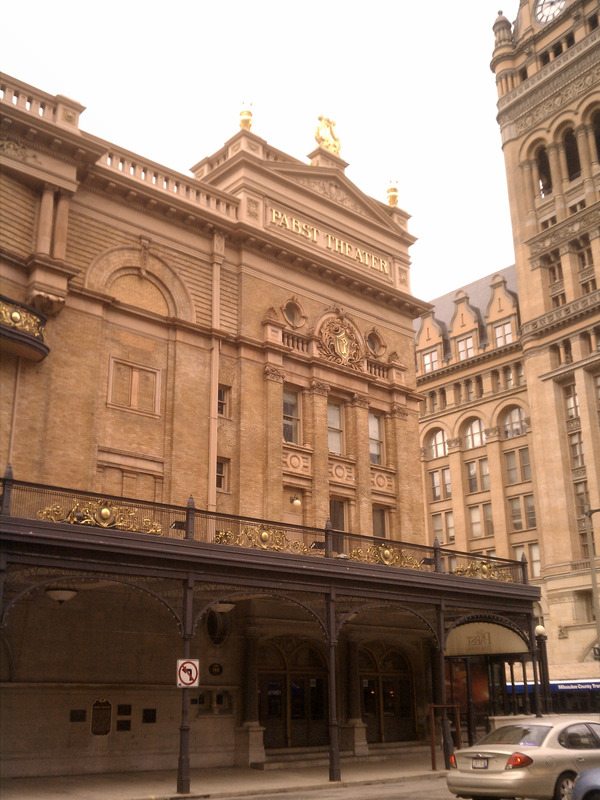 Adjacent to City Hall is the ornate German Revival Pabst Theatre. Also from 1895, this is the fourth oldest continuously-operating theater in the US. The German heritage in Wisconsin really shows through while walking around MKE. I can’t wait to visit again so I have a chance to really understand the makeup of the city in the warm weather. After rounding a total of 4 blocks, I headed back to the car and snapped this alley across from the “Furness Building” shown above. Being in the middle of the work day in early spring, the almost-vacant streets should not have been a surprise. That said, there was an abundance of street parking and few pedestrians. I would not say this section of the city looked abandoned, crumbling or neglected, but it did seem a bit lonely. How occupied are the office suites in these magnificent buildings? This small 50’s Art Deco-style facade caught my eye. How much is the rent on a nice little building like this? On the way out, I parked again and noticed a huge amount of recent condo development in the Third Ward area, just south of my walk near city hall. The above scene is right in the Third Ward, or just below it as it were. 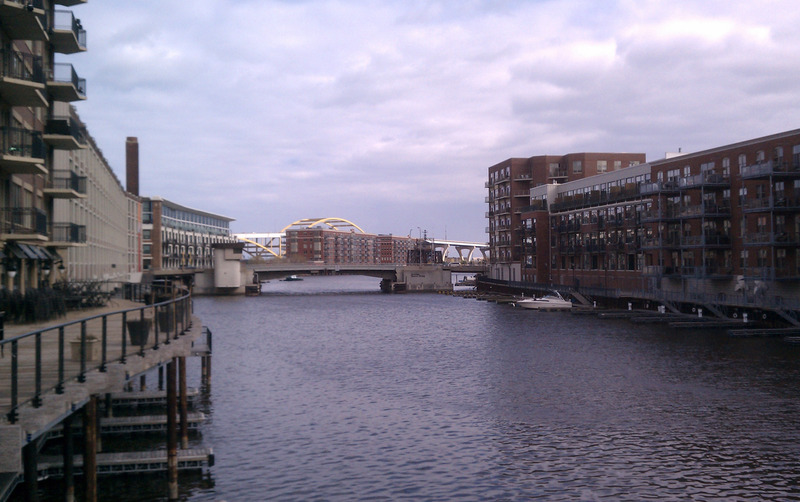 I think this is the main channel of the Milwaukee river as it heads under the 794 bridge and out to lake Michigan. [EDIT – the south side of the river is called Walker’s Point] What is striking about this scene is how much this looks like Amsterdam! There is so much new construction and much of it modern and fashionable. This waterway must be very lively on a sunny Saturday afternoon in July as people are walking on the promenades and the river alive with boat traffic. There are lovely scenes along the “canal” section of the river as well, where it snakes through the canyon of buildings. I ran out of time, and there were construction barges all over that section anyhow so this all definitely warrants another visit in the warm weather later in the year. After driving under a Calatrava bridge, I turned back onto the expressway and back to the airport. My business in Wisconsin will hopefully be fruitful and I look forward to coming back many times, to spend more time in this gem of a city.